“Africa, Performed”—this map is really only a “dress rehearsal” of a cartographic “play.” Who is Mr. Bolton? His true identity is obscure. 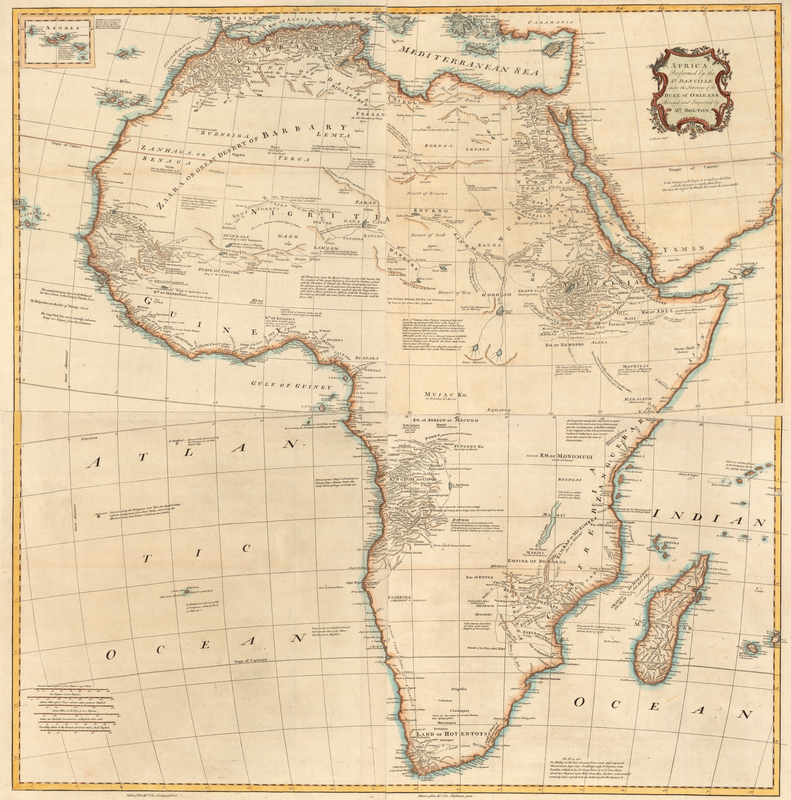 In this exhibition, he assumes the role of an aspiring 18th-century cartographer (the “director”), wanting a better map of Africa, who is willing to wait a while for it to be “staged” properly. His map presents the potential of the material on the eve of “performances” of exploration and discovery that would entertain and enthrall European audiences and inspire and embolden their governments. His note next to Ascension Island in the Atlantic—that English ships stop there to “refresh” on their way home from the East Indies—is telling: at this moment, Africa continues to be ignored. In the vacuum caused by the lack of firsthand information, early cartographers were forced to draw heavily on the ancients, primarily Ptolemy and al-Idrisi, for their geographic details of Africa. Even as late as the 1760s, Mr. Bolton makes references to both men in his numerous notes. The first word on Africa was that of Claudius Ptolemy (ca. A.D. 90-168), and it was good—for a starting point. Not to be confused with Egyptian kings of the same name, Ptolemy lived in Alexandria and wrote on such subjects as astronomy, astrology, music, history, optics, and geography. His Geographia, written in Alexandria around 160, was a manual on the construction and drawing of maps. What happened to the manuscript over the next thousand years is not known, but fortunately copies of it survived in Greek manuscripts dating between the 12th and 14th centuries and brought to Italy around the year 1400 on the collapse of the Byzantine Empire. These manuscripts were divided into eight books and contained mapmaking instructions with the first fully worked out map projections, tables of towns and physical features with their latitude and longitude coordinates, and (in Book VIII) twenty-seven maps: one world map, ten of Europe, four of Africa, and twelve of Asia. 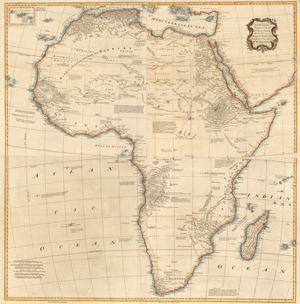 Of the maps of Africa, only the fourth dipped below the equator, showing the fabled Mountains of the Moon and two lake sources for the Nile, as well as unidentified, vaguely located mountain groups in the west. Virtually nothing else of the continent was known or conjectured. So pervasive was the influence of Ptolemy’s work that printed editions continued to appear across Europe for 250 years (1477-1730), with modern maps added by prominent cartographers to the nucleus of twenty-seven “ancient” maps. The Arab geographer al-Idrisi was born in Sebta (Ceuta), a Spanish enclave in northern Morocco, and traveled widely in North Africa, Spain, and even Asia Minor during his early life. Other biographical details are few, including how and why he ended up in Sicily around 1145 as an adviser to Roger II, the Norman king of Sicily. His work for a Christian king would have led other Muslims to regard him as a renegade and probably to shun him. While in the king’s service, al-Idrisi constructed a silver planisphere and a world map. Shortly before Roger’s death in 1154, he completed the descriptive text that was intended to be the key to the planisphere, Kitāb Nuzhat al-mushtāk fi ‘khtirāk al-āfāk (“The Pleasure Excursion of One Who Is Eager to Traverse the Regions of the World”), also called the Book of Roger. It is considered one of the greatest works of medieval geography. In compiling it, al-Idrisi drew upon Greek and Arabic geographic works, which he supplemented with firsthand observation and eyewitness accounts. The world map had seventy sections: seven climate zones of equal horizontal width, divided by ten equal parts of longitude. Though the planisphere has been lost, copies of the map and the manuscript have survived. In the part of his map devoted to Africa, al-Idrisi showed dual Niles joined at right angles, one running north-south, the other east-west. Several important cities were named, though vaguely located, such as Timbuktu and Tacrour (Tekrour), which were flourishing Muslim cities at the time. His descriptive text provided rich detail about the interior of northern Africa and the trading activities of various regional groups.